I actually liked Dalton's casual look in LtK. Some fans had a problem with the way he dressed in the film due to his lack of wearing a neck tie in the film. Well, since this film is not your average Bond movie and since he was really bent on revenge, you can't really blame him for his looks. Dalton seems to be much more comfortable when he just has an unbuttoned shirt and pants. But yeah, he still retains of overall look of how Bond would be just dressing casually. The only thing I disliked about Dalton's look in LTK was his hairline. His makeup artist should've been fired. The director should have been fired for not firing the hairstylist. The producers should have canned themselves for letting the product go out that way. His hair's always bothered me too. Especially when he has it slicked back with the tux. I get he was playing a role for Sanchez but still there's no point in changing his style. Unless he was trying to look like an uptight jerk to sell his story. If so I have to say it worked. Should have went to a similar style to TLD. He had great hair in that movie. Couldn't help but notice. Unless he was trying to look like an uptight jerk to sell his story. If so I have to say it worked. I think that may have played a part into the style choice for Dalton's hair in LTK. It doesn't really bother me at all, whether it was intentionally done for this reason or if it was just an "oversight" by the production crew, it doesn't hamper my enjoyment of the film one bit. It's also not the worst hair style we've seen on a Bond actor, either. I had no problem with the look he was given. Most of the film occupies the idea of a rogue-Bond out for revenge. Presumably his look stems from not necessarily being on the firm's time and being undercover for his own safety. Hence, the slightly more casual up-taking. Edited by Trevelyan 006, 22 January 2013 - 04:06 AM. Yeah! His hair is much better in TLD. When Bond has his hair slicked back it does look odd. It's obviously not meant to be combed that way. It also made him look odd. I much prefer his hair earlier on in the film and after the Casino de Isthmus scenes. OMG AGREE! Lol sorry that's in cap locks but it's true. He looks so much sexier in The Living Daylights then License to Kill and I think that's why. You are really obsessed with Dalton´s hair, my friend, hating it in several threads. But rest assured, EON will probably never let it happen to Craig. I think his hair only looks horrible in the casino scenes in LTK. I don't mind the causual look to it in the rest of the movie, but that Dracula look was pretty bad. I agree it was better on the whole in TLD, but it's only those few scenes in LTK that I don't like. I think Dalton cut a fine look as James Bond, a realy hard-edged Fleming look. Almost like he was a Bond that enjoyed dressing as smartly as he did casually for this missions. 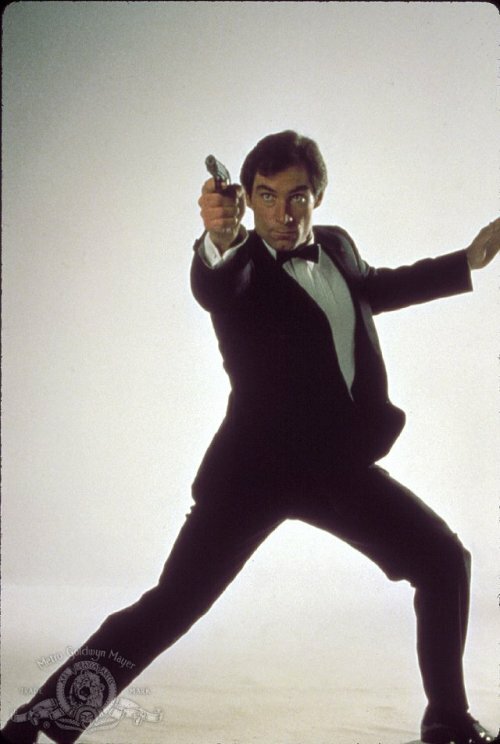 He also had some brilliant, if not the best, marketing shots as 007 and really carried off the look I feel. but his hair... it looks really weird. Definitely agreed, especially on his marketing shots. They're brilliant, and by far the best of all the Bonds, and I think that I'd still arrive at that conclusion even if he weren't my favorite actor to play the part. It makes the marketing department's failure on LICENCE TO KILL even more astounding given that they failed to put together a good campaign for someone who excels at modeling for still photography as James Bond. Here here... he has the agression, the coldness, the machoism, the skill, the look, the confidence and the humanity just from a still shot. A brilliant legacy from just 2 films. THAT is my James Bond pose! Okay, I think I might actually have to tweet that. I love it. It's great ain't it? Tweet away! That pose is definitely one of the best of the publicity shots. The tanker graphic above is also quite good. Just casting Craig, let alone allowing him to dictate creative aspects, should be enough to get the Bond descendants forever barred from their ancestral heavenly realm. I used to use the 'vampire hair slicked as way of putting across rogue agent' explanation to rationalize the LTK hair (in fact I think I invented it, using it in a letter to a friend in summer 1989), but the reasons for it are largely irrelevant, because the EFFECT is annoying and distracts, rather than informing character or drama. He dresses quite like Fleming's Bond in LTK; lots of casual shirts and jacket looks. His outfit in Key West feels very Fleming. I think I prefer his LTK hair, too. The sort of short, flat look he has in the bar scene among others. Sideburns work well. Works in Daylights but looks a bit 80's bouffant now. Dalton seems to be much more comfortable when he just has an unbuttoned shirt and pants. Oh, that made me almost spritz a drink of water onto my screen! LOL! I like Dalton as Bond but he never quite had the fighting chops or at least they never gave him a chance to do a great Punch Up. I agree delfloria - he nearly had it in the bar during 'Licence To Kill' but ended up worse off I think, and should never have been given a swordfish to weild! Still, I think it's his simmering emotion that he always manages to keep under control, but makes Dalton's Bond look very dangerous, ready to explode at any minute and really gives off his steely, cold exterior when pushed without ever losing it. Yeah I agree, he never really gets to fight anyone. Obviously not. I was just referring to the shirt. According to The Making of Licence to Kill book by Sally Hibbin, it does has some information about costumes. Basically it states "Bond is caught off guard so he's not really prepared for this sort of an adventure. He was going to a wedding and had just a couple of outfits in a suticase, so we were restricted by reality." - Jodie Tillen the costume designer. As for the hair book doesn't go into detail unless the Fleming books talk about Bond's hair, because the book also mentions that small details such as Bond having long eyebrows impacted Dalton's role. I think it was Dalton's own choice to comb his hair like that. He slicks it back for the casino scenes. Perfectly sensible choice. What´s the big deal? Dalton looked great, a perfect Bond. And I agree with tdalton linking to the unused publicity photo. That would have been perfect! He looks like Bela Lugosi. And who does not love Bela?